Is it me? Or is the bike lane surface on Pine St beginning to look like a bombing range? A contractor doing utility work on Pine St has placed 3 steel plates and orange cones on the 1000 block of Pine St. 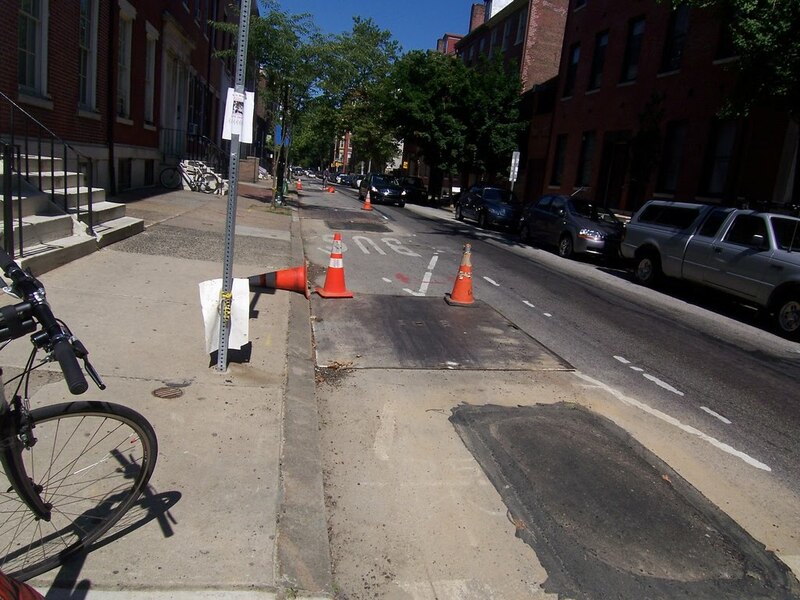 This is another disruption for Pine Street cyclists who are enduring an ever rougher ride. Waiting for the Streets Department to pave the street in the fall. The City's Bicycle Pedestrian Coordinator has been notified and will be discussing ways to make these locations safer. Some possible actions include placing warning signs before the construction area and replacing the plates with a smooth patch at each location when work is complete. The contractor is doing fiber optic cable work from 11th to 4th street so expect the steel plates to move down the street over the next several weeks. You guys should see the disaster area on Front St just south of the Berks stop in Fishtown. That's a nightmare for everyone. The leading and trailing edges of the plates had small tarmac ramps earlier this week that actually made them smooth enough to ride over, but today, back to a tall lip with no transition. 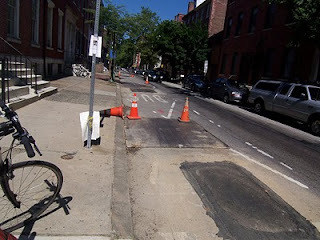 How about the steel plates at 17th and Spruce in the bike lane for the past 2 weeks? The steel plates on Pine and 9th are now gone, replaced with large patches.